The Wednesday gang was about the extension in three different places today. Camera coverage was mostly with this gang, which was working at Broadway north to resleeper the buffer stop we placed there. This being only a buffer stop (and, we hope, a temporary one) we used some of the better second hand sleepers that came out of last winter's relay at Winchcombe. Eight were loaded on to the red Transit, and were unloaded at the end of the line, literally. Our property ceases at the fence in the background, then the empty trackbed, owned by another, carries on to Honeybourne. The first job was to remove the chairs from the second hand sleepers. Yours truly is used to SR chairs with 3 chairscrews per chair; in this, the GWR region, we have 'through bolters' with only two bolts holding the chair on. This is fine, until you need to get an old one off. The nuts on top of the chair are mostly seized solid. Underneath you have a steel plate, which likes to revolve if you try to take the nut off the other end. Our solution to the seized nuts was to cut them in half, then knock them off with a hammer. Crude, but effective, if a little tedious. Note the GWR chair, from 1946. Once the nut is off, you are not home yet, as the bolt is then stuck in the sleeper. To get this out you use a (SR!) type chair screw and try to hammer it through. There were few volunteers for holding the screw while Paul swings the keying hammer at it, so he had to both hold the screw, and wield the hammer. 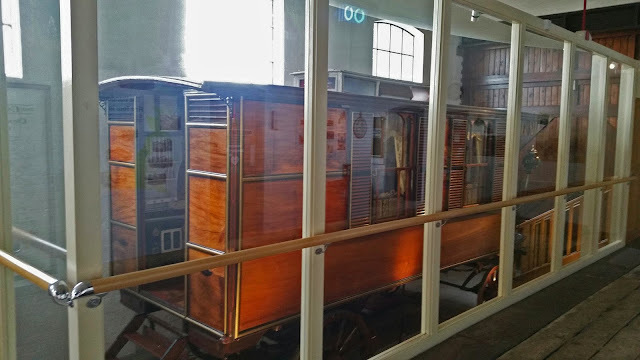 The now naked sleeper was then pushed under the buffer stop, which was equipped with special wide chairs to support the pairs of rails on which it rests. Consternation - it won't go under! This means yanking it out, and digging the sleeper bed deeper. Finally, when the sleeper is in its intended place, it can be drilled to accept the new chair screws, which are screwed in from above. Trying to start the nut runner resulted in a snapped pull cord, and for extra enjoyment the drill bit got stuck, and then detached itself from the drill. All part of the fun. Hallo, Dave? Dave ? Is that you? To start with, Rick was on his own at the buffer stop, no sign of sleepers or the rest of the crew, led by PWay section leader Dave. Solution : Call Dave on the mobile and ask where he is. Rummage in pocket for mobile. Discover that it is switched off, explaining the perplexing lack of inward calls. Rummage for reading glasses. Reading glasses have only one lens, but still work. Find Dave in the list of names, scroll down, scroll down, ah: Dave! Dial Dave. Dave answers. A reasonably long telephone conversation ensues, in which he is asked for his whereabouts, when is he getting here, will he have the kit with him. It takes Rick several minutes to realise that the apparent puzzlement at the other end is caused by the fact that he has dialled Dave the retired schoolteacher, and not Dave the PWay section head! At the end of the afternoon we were pleased to be able to say that we had licked the old buffer stop into better shape, with a good set of sleepers under it. A number still need replacements for broken chairs, which needs a good poke round the yard at Winchcombe to see what we have. The other job that still needs doing is that it needs plating up to the running line. Here we have a clash of cultures, where second hand flat bottom rail meets bullhead section buffer stop. We think the latter may even by a lightweight 75lbs / yard, instead of the usual 95lbs, so will we be able to source some transition fishplates for that? It's a very unusual combination. Beyond the bufferstop is our fence, then the overgrown trackbed, all the way to Honeybourne. A second gang spent most of the day in the Peasebrook Farm area, where the track needed to be fettled and sleepers straightened. The Landie could not use the vehicle crossing just off camera to the right, as it isn't finished and the angle is too steep for it, with its low rail wheels out front. So the gang picked up their tools and walked it. At short notice today we also received the visit of two crews from Haigh Rail, as they had an unfilled slot in their diary, and that suited both of us! We had 6 welds that they could do for us, which will take the completed, fish plated / alternately welded track up to the bridge. They day was brooding, with heavy clouds and occasional heavy downpours, just as forecast (unfortunately). In this section of track with alternating welds and fishplates (120 foot sections) the fish plates are on, and here one of the Haigh Rail crews is heating the first weld of the day, with the familiar 'Vee' of flames shooting out of the top of the moulds. They had a new form of crucible with them, seen here, which didn't spit and crackle as much as the other ones used to. Here the reaction is in full swing. Afterwards the crucible could be lifted away with a gloved hand, thanks to its insulating properties. The second of the two gangs was located nearer to the Childswickham Road bridge, and is seen here attaching the moulds to the next gap to be welded. The goods shed and Broadway footbridge can be seen in the distance. Pete Hooper, an avid reader of the blog, and user of the Caravan Club site, has sent in some photographs of the former Broadway goods shed, in its new life as a shower block for the club. This is the Cotswolds side, which for us PWay workers on the trackbed, is never seen. 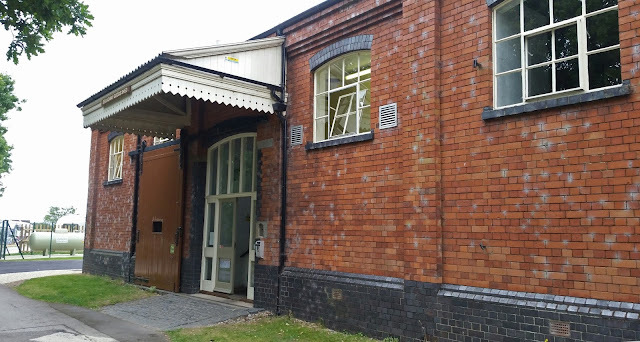 The original heavy sliding door is still there, and the building is in excellent condition, having been very well looked after by its new owners. Inside there is some lovely new tiling in white brick shaped tiles (left) and the former goods wagon road has been fenced off, but is still accessible via some new steps, that lead to a games area below. The BROADWAY totem in the background is a replica fantasy of course, as our line didn't have these totems, but it does somehow look the part. Who actually owns the trackbed to Hoheybourne ? Sustrans I have read on other groups. Have you considered welding the transition from Bullhead to Flat Bottom rail if you can't find any suitable junction plates? That's an option of course - let's see what is in the back of the GUV first. Hopefully those buffers will migrate northwards in the future! Will the security fencing behind the buffer be painted green eventually? I think not. Bare metal was cheaper than painted, and in any case the fence is a good 300 yards away from the end of the platform. You can barely see it. It may well be that brambles will grow over the top, as they have already vigorously grown up to the sides and into the fence. As always, great photography. 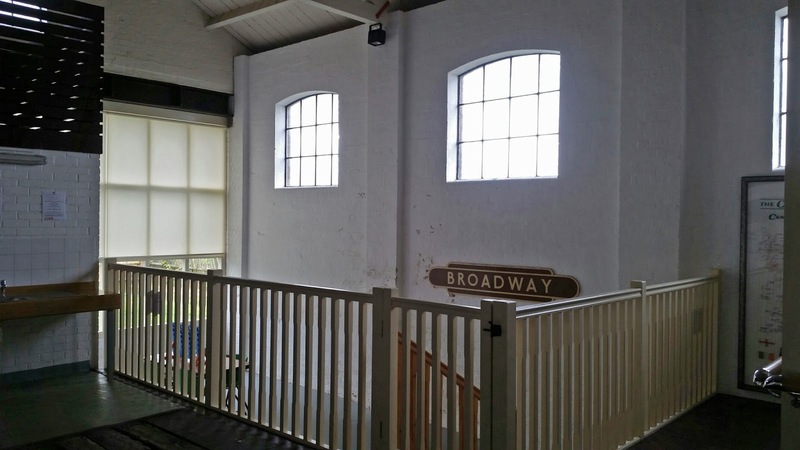 Great pics of the goods shed. Now if only they could be enticed to paint that canopy light and dark stone.......... Before anyone writes in about quip about LNER wagons, I thought that I would help out by explaining that the LNER used TEAK carriages; varnished and then the wording added and looking like it had just had the woodwork covered in syrup......Sorry!?! Regards, Paul. Do you have any idea,where the stop block,came from?.It's not a GWR,/BR,Western Region,one!.I,think,that it'll remain where it is,for many years,yet!.The Goods Shed,certainly looks very well looked after!.Regards. Anthony. I don't know, but I could ask. My guess is the MOD, as it's 75lb and one of us used to work at Ashchurch. Re: Temporary buffer stop. Yes, the Springfield Lane Bridge looks on as if to ask, 'When's it my turn?' Thanks to everyone for such a great enterprise. I hope to be bringing a 4th group of vistors to Broadway next month. And I have just read about the ownership issue, so Broadway 'only' it is!